Yesterday was a beautiful day to be in the hives. The sun was shining, there was a light breeze and the bees were humming; busy at work in the hives, still prepping for winter. The hives were still bringing in bright orange pollen from some late blooming yellow flowers along the road. What little there was the bees were able to find. My day was filled with thinking about what the hives needed and making sure they got it while I could still work them in this unseasonably warm weather. The bees have been taking advantage of it too. Foraging trips back and forth to the community feeders, bringing in the 2:1 syrup, packing it into the few empty spaces left in the hives. And trips to my little water ponds in the yard, bees gingerly walking on the pea gravel and what's left of the duckweed and gathering water to take back to the hive. Careful all the while to stay away from the goldfish and frogs still active in the ponds. and mulched, ready for the winter ahead and to bloom for the bees in the spring. I find that gardening for the bees is just as important as taking care of the bees themselves. It also gives me an excuse to play in the dirt! Finally at about 10:30 am the weather warmed up and I was able to work on my queen castles. Queen castles are 4 sectioned deep boxes that hold 2 deep frames in each section. They are my preferred method of starting queens because you don't have to start with many resources, just 2 frames. Usually every parent hive should be able to spare 2 frames as different times of the year. 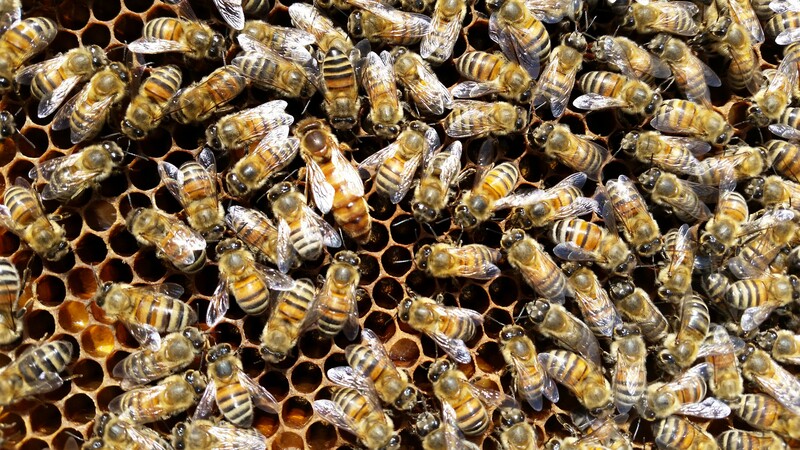 Each one I checked had a viable queen still laying with a frame of brood and a frame of honey. Those were transferred carefully over to nucs and feeder jars placed on the tops of them. That's one of the easiest ways to feed nucs that I've found, besides using frame feeders. With a jar feeder on top you're not wasting space inside the nuc for them to grow. These baby nucs that I took out of the queen castles will be fed sugar syrup and given another deep nuc box of honey to make it thru the winter as double nucs. I'll also put a shim on top of them and give them a protein patty so they build up their brood for their winter cluster. After I finished transferring all the queen castles I then went and started Oxalic Acid treatments again with my ProVap Vaporizer. It works great and I find that I can do about 100 hives with it in 2 hrs at a steady pace working alone. Provided the weather is a little warmer and my back doesn't give out. One by one the hives were treated with the Oxalic and little by little I made progress thru the rest of them in the yard, nucs included. So I can have peace of mind that the bees have been treated for mites several times this year and should be good to go thru the winter. I finished up what I was doing about 3 pm and went to our bee store quickly for a bit then off to Lowes I ran to pick up some flower bulbs. We have been working on our landscaping on the farm and making it more visually appealing and more of a sanctuary for the bees and other native pollinators. I picked up several bags of mixed Daffodils and Crocuses so that in the springtime the earliest blooming flowers will be ready and waiting for the bees to pollinate them. Even tho it may be a few compared to how many I'd like to have planted, the bees will certainly find them and enjoy them come spring. Never underestimate the power of planting flowers. Not only is it therapeutic but it will give the bees a source of pollen and nectar early on when not much else will be flowering. So not only will I be able to garden but I'll be feeding the bees at the same time! Talk about multitasking. Gardening, check. Feeding the bees, check! And so another day ends in my life on the farm as a beekeeper. One day at a time, precious moments to reflect on as the day draws to a close as the sun sets on distant horizon. A cup of decaf coffee in hand, snuggled on the couch with my pups, life is good.